The original idea was to go round Britain in a week on the coast roads, but after some thought on the monotony of being confined to the vehicle the whole time and a little research into the quality of some of our coast roads, we decided that a far better week would be spent by visiting just Land's End, John o'Groats and London; and on each day to climb the highest mountain on route. The mileage to be covered still seemed fantastic, so we decided to have a trail run over a week end in October, 1958. For our purposes we hired a converted Bedford doormobile, and in the course of 48 hours we travelled about 650 miles and did 11 hours hiking. The week end proved very successful and at the same time showed us many points upon which we were unnecessarily wasting time. With this 48 hours experience behind us we planned the major trip which we were to make in the following June. We decided to use once again a hired 12 seater Bedford dormobile. 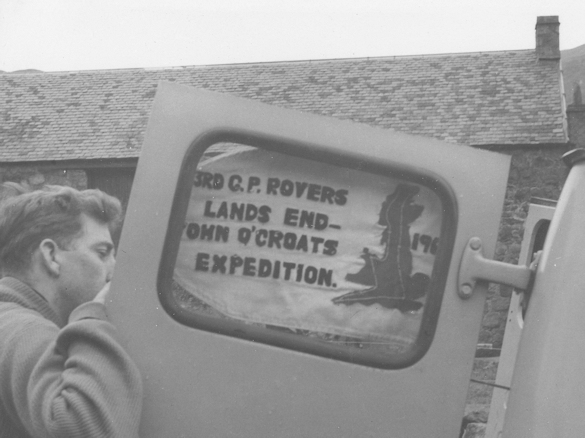 Seven members of the Crew anticipated going, although at the last moment one was unable to make it and Akela, a pre 1956 rover, took his place. While all seven of us were to visit the three extremities of Britain, only two members of the party would climb the mountains; there being seven of us, each would climb two of the seven mountains. In order to save time we bought all our food except bread before leaving, dehydrated items were kept to a minimum in view of the time involved with their cooking and their non-appetising nature. We left Maidenhead at 5.45 a.m. on Saturday, 30th May, A log had been prepared to show us at any time where we ought to be on our route, it was based on starting each day at 5.00 a.m. and stopping at 9.00 p.m. Between these times we had be maintain an average speed of 27.5 m.p.h. inclusive of all stop's except those for climbing the respective mountains each day. The first of these unexpected stops came after six miles, when to our horror we developed a puncture in our offside rear wheel. 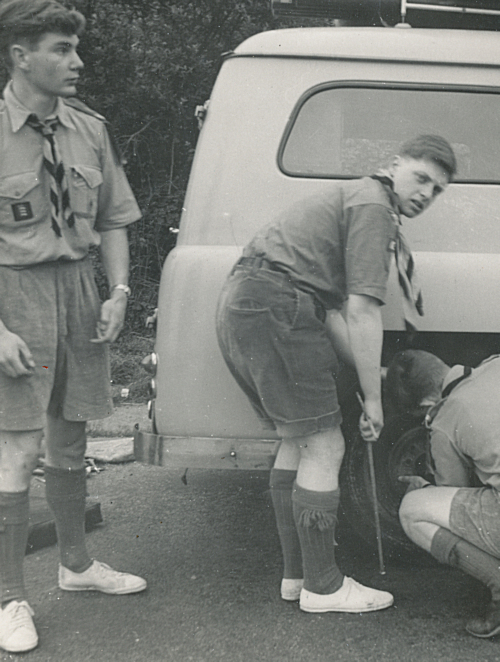 The tubeless tyre proved to be defective at the seam, and although it would not hold a high pressure we decided against renewing it as it was for a hired vehicle, and using the spare in its place we continued, We were now well behind schedule, but on good roads the speedometer was soon stretched to its limit. The first stop was just outside Okehampton where two of us were to climb High Willhays on Yes Tor (2039ft. ), but there was no resting for those left down below their task for these intermissions each day was to prepare lunch, refill the vacuum flasks and water can, air all sleeping kit, clean the vehicle inside and out, wash and shave, and if any time remained after repacking the gear they were lucky. However on this particular occasion time was found to have a quick swim in a nearby stream. By 6.00 p.m. we had arrived at Land's End where we stayed for about an hour before piling back into the dormobile and making our way to Bodmin Moor, our first campsite. The next six days followed a very similar pattern, the alarm clock always set for four o'clock, and we found that we could maintain excellent speeds until 8.OOa.m. on the almost deserted roads. The next day took us through Bristol and across the Aust ferry where we were held up for an hour and a half, and all but the driver elected to get out and walk! Thus into Wales where our route lead us off the main roads to manoeuvre some of the steepest of hills and sharpest of bends making us well behind time when we arrived at Snowdon (3560ft.) While the two climbers made their way up the pyg Track, we took the dormobile as far along the Miners Track as is possible and found our second campsite about a mile from the Pen-y-Pass. Scafell Pike (3210 ft.) was on the program for the third day. The climbers had a magnificent view from its summit, being able to see as far as the Isle of Mar. but there was no rest for them and they returned in an excellent time to find tea still brewing. Confidence in our being able to achieve our target was now growing, but we could not foresee the hazards that lay ahead. That day we travelled in Wales, England and Scotland, camping about 50 miles over the latter's boarder in the middle of a disused tarmac road. Ben Nevis (4406 ft.) was climbed in thick mist, with snow underfoot at the top. Our route then took us through Inverness end across Sutherland to Durness going as near to Cape Wrath by road as is possible, although this added a few unnecessary miles. Turning towards Ben Hope, our next objective, we met our first major setback; the route led us along a very rough unmade road for five miles over a pass with one in five hills each side. At the end of this track we found a river in flood, and the ford, the only means of crossing, was most definitely impassable. We returned along the track to the road where we decided to spend our fourth night, and finish the twenty mile detour the next day. In the course of this detour we once again left the main road, and having driven four miles along another track our front nearside wheel hit the corner of a sharp piece of rock, causing a burst tyre and the dormobile to come to rest with two wheels in the ditch. We could not have chosen a place further from civilisation! The dormobile was unloaded, jacked up so that the ditch could be filled with rocks and driven out. While the two climbers set off for Ben Hope (3040 ft.) the defective spare wheel was fitted and very carefully we drove back to the main road. Meanwhile we had contacted the nearest garage from a telephone four miles away, and a mechanic brought us a wheel which we could use for the further sixteen miles on to his garage. The two climbers, however, were not finding easy going on Ben Hope. They came across rock faces 1000 ft. from the summit, and bearing in mind the danger their might be by tackling these without the necessary equipment and also the time factor with regard to our arrangements in Thurso, they reluctantly turned back. We had missed our target by 1000 ft. but we were still determined to finish the -trip within the allotted time. We stopped at Tongue where our two tyres were receiving attention, the burst had been vulcanised and a new cover had been fitted to the other wheel. We had arranged for the dormobile to have its 1500 mile service at McKay's Garage, Thurso, and we arrived just in time for them to do the necessary during business hours. With renewed vitality we completed the North coast of Scotland, arriving at John o'Groats just over four days after leaving land's End. We did not stop until 10.00 p.m. that night, but were up at the normal time in the morning. The climb for the sixth day was Ben Macdhui (4296 ft.) highest in the Cairngorn mountains and situated eleven miles from any road. It reduced our driving hours considerably and when we camped for the last night we had only just crossed the English boarder. Before we arrived at Kinder Scout we noticed a slow puncture in one of the wheels, once again the jack earned its passage as the wheel was changed for the one that had been repaired in Scotland, but the repair to the burst tyre did not last for ten miles and yet again we found ourselves changing a wheel. The slow puncture had to take us to the nearest garage where an inner tube and gaiter solved our problems. While we were having this done we decided to change the wheels from front to back with the result that at one point the vehicle was supported by one wheel, umpteen jacks, blocks and wedges.......... and Akela - Good old Akela! As Kinder Scout has not a peak at its summit, we chose to climb the mountain by the Edge and visit the triangulation station at 2031 ft, thus establishing a definite point on the plateau. Soon this last mountain was behind us and, once again we were recording good speeds as we made our way to the A. 5 and London. We arrived back at Maidenhead at 9.45 p.m. exactly 160 hours after leaving, the mileometer reading had increased by 2304 miles for which we had put 90 gallons of petrol into the tank. After being subjected to the equivalent of five weeks' normal hiring the engine showed very little signs of deterioration; but this fact was not true of its seven passengers! Apart from the one small failure on Ben Hope we had accomplished all we had set out to do and with eight hours to spare. The cost of the trip turned out to be a little over £10.00. each, which included food, petrol, and hire of the vehicle, the cost of the motor repairs that we incurred being borne by the owners of the vehicle; however in addition we all contributed a further sum towards a film made of the trip. We had all enjoyed a most unusual holiday, although Akela called it the 'Round Britain Whizz' and likened our conditions to those of seven goldfish in a rectangular tank. "We put forth a challenge to any other Crew in the country; firstly to complete the course in a week, and secondly to complete it in less time. 2. Only one member of the party need visit the top of the same seven mountains, not necessarily the same Rover(s) each time. 3. The cost must be kept within a reasonable budget of a crew camp. 4. The party must finish at the place from which they start. 6. The party must be self contained, and not dependant upon prearranged outside help during the trip. Les. Page Assistant Q.M - Food. The expedition caused few actual navigation problems. Those encountered were due to insufficient large scale maps of localised areas, such as towns or minor lanes where short cuts between 'A' class roads were being sort. All the occasions on which time was lost are subsequently listed under various headings and a short summary of each section will be found below. This section proved our greatest time loser, although we had no actual engine breakdowns. The time lost was mainly due to punctures and the subsequent repair of the tubeless tyres at garages. About 2 hours were lost with the actual punctures but 2 hours 37 minutes were lost in their repair. The regaining lost time was due to the gear lever jaw breaking and its temporary repair, a combined time of 2 hours 38 minutes Total time lost was 7 hours 15 minutes. There were ten areas where road conditions caused time to be lost, of these five were in Scotland, one in Wales and four in England. Needless to say all except one were in mountainous areas, the exception was traffic congestion at St. Albans. Traffic diversions caused two changes of route but only one caused a recordable loss of time, that being at Broughton in Furness, Lake District, Lancashire. The time lost here was only five minutes over a distance of nine miles. The other two occasions in England were five minutes over five miles from Greenodd to Newby Bridge and forty minutes over 21 miles from Denby Dale to the Snake Inn, Derbyshire, this included a level crossing. Road conditions in Wales accounted for 10 minutes, this was between Maentwrog and Beddgelert a distance of nine miles. We paid dearly for the wonderful scenery in the Highlands of Scotland. Over the 31 miles from Laxford Bridge to Eriboll Sutherland the road wound and twisted causing a loss of 22 minutes. The section of road that was to take us to Ben Hope from Eriboll was no more than a track that hair-pinned on four occasions on a 1 in 4 gradient. On arriving at the ford at the eastern end of the track we found it impassable due to the previous weeks bad weather, so the return journey to Eriboll and the main road had to be made. We lost 1 hour 10 minutes over this. Two minutes were lost on the 13 mile stretch between Tongue and Bettyhill due to the narrow, hilly and winding road. The Cairngorm area of Invernesshire spent another hour of our available time, this was a distance of 41 miles between Tomintoul and Ben Macdhui including a lengthy petrol stop at Tomintoul. The cause was bad road surface and winding roads. Not previously mentioned was a. loss of two minutes due to winding hilly roads in the Caledonian Canal area from Invermoriston a distance of 43 miles. The total time lost in this section was 3 hours 43 minutes. The time lost in this section in England cannot be remedied by change of route but possibly that caused by traffic congestion could be by changing the time of travelling. Bad roads in South Wales could be avoided by going north from Bristol through Hereford and Shropshire possibly to the A5. Time lost in Scotland is again mainly unavoidable. The route could be shortened by altering the approach to Ben Hope in Sutherland, by going on the A836 from Altnaharra and the junction of the B873 where the route would turn west along the ill fated track that skirts Ben Hope. After Climbing the mountain the route could continue through to Hope Lodge, thus picking our original route. This would save time on main roads but would increase the distance on a very poor track. The areas that are unavoidable all lead to the point of a climb, and to reduce the possibility of hasty driving in these areas a lower average speed based on the 1959 trip for these areas could be employed. 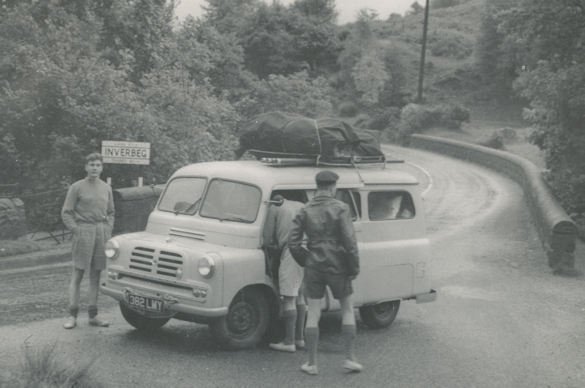 The subsequent loss of time could be compensated by increased averages on good roads, again based on the 1959 trip. Not unexpectedly we lost time on striking camp. On two occasions our downfall efforts were further impeded by rain. The total time lost in this section was 3 hours 32 minutes with the longest time overdue being 55 minutes due to a downpour at Snowdon. Time lost here could be reduced by reducing the team and scheduling sleeping stops every 36 hours instead of ever l6 hours, arrangements to sleep while travelling would have to be made. This would reduce sleeping time on a 4 day trip by 16 hours. This section accounted for 2 hours 36 minutes of the available time. The first occasion was Lands End where 1 hour 14 minutes was spent in tourist fashion John o'G-roats added 34- minutes to the lost time but by this time our holiday spirit had a little more fight in it. The ferry at AUST lost us 26 minutes, a very pleasant double tea break at Carstang was 30 minutes and an unusual pulley bridge for pedestrians in the Highlands claimed another 12 minutes. The event of these arising in a more ambitious trip are unlikely as they were stops that added interest to the trip that was not entirely competitive. The ferry at Aust would be avoided by re-routing through Gloucester. Stops at Lands End and John O'Groats would be only to reach the water line and this could be allowed for, if necessary in the schedule. The two items in this section caused a total loss of 1 hour 18 minutes. At Thurso 1 hour 11 minutes was spent on a service for the van, this was required in the conditions of hire. A level crossing at Yoxall in Warwickshire cost us 7 minutes 'There were other level crossings but this was the only one which caused us a recordable loss of time. The service at Thurso could be remedied by doing our own servicing, unless the same hire conditions apply again. The level crossing is completely unavoidable. The last, but most important, section that of navigation lost the team only 49 minutes in a distance of 2,303 miles of constantly changing route. We went astray in South Wales between Llanidlocs and Llanbrynmair on some very badly signed roads but no time was lost; on the other hand valuable time could have been made up if we had stayed on route. The most we lost in this section was on our home ground from St. Albans to Maidenhead a distance of 34 miles costing 17 minutes. Our few problems here will no doubt be eliminated by the use of larger scale maps and re-routing along 'A' roads, plus the knowledge gained of the route on the 1959 trip. It will be necessary to be on good roads where possible during the night to facilitate navigation at higher averages. SOURCE OF EXTRA DRIVING TIME. Time was made up on all the mountains except Ben Hope where a puncture thwarted our efforts. At Snowdon we were 2 hours 53 minutes late, but we made up 1 1 hour 23 minutes of this on the climb and the remaining 1 hour 23 minutes was eliminated over night as we camped in close proximity to the climb. The other mountains allowed us 5 hours 36 minutes for extra driving time. The remaining time comprises 50 minutes extra driving to return to Eriboll and the unaffordable ford. Deliberate overdriving on the remaining three nights added a further 2 hours 43 minute to the available time. Total time made up and later overdriven was 13 hours 2 minutes. The driving time averaged was based on 27.5 m.p.h. Total driving time lost was 19 hours 33 minutes. Total time gained and subsequently overdriven was 13 hours 2 minutes leaving 6 hours 31 minuets to be made up by increased driving speed. This was done at a driving average of about 31.3 m.p.h. In the light of this the next trip could have an increased average of about 2 m.p.h. to 29.5 m.p.h. LIST OF TIME LOSING FACTORS. In. providing the equipment for this expedition the usual yardstick of "something to sleep in, something to eat in and something to wash in" was to prove somewhat inadequate. Therefore an entirely new approach had to be made in arriving at a final collection of gear. Two problems faced us - what to take and how to take it. It will be appreciated that seven bods in a doormobile left little enough room for necessities let alone unwanted items. The training trip in October 1958 proved invaluable and a number of ideas were proved practical and other, down right the opposite. To take the second problem first "How to take it". The dormobile was a 12 seater and we numbered seven, therefore five spare seats. Two lockers were provided under the rear side facing seats and we had a roof rack. A final gear list follows so I'll comment only on the salient points. Prior to the training trip we had made two "grub boxes" one containing, in fitted compartments, Nest of billies, plates, irons, mugs and food needed for preparing meals while mobile. This box was carried inside the van. The second "grub box" contained the stoves, frypan and washing up material. As none of this equipment would be required while moving, this box was destined for the roof rack. Also on top was carried all the sleeping Bags, Lilos, Groundsheets and sleeping clothes in three large waterproofed kit bags. An open box carrying the reserve petrol, paraffin, meths and other sundry equipment also found a home on the roof along with the tent and poles. A canvas cover and elastic octopus protected the whole from the elements. Prior to the expedition proper another set of containers best described as a "stretcher" was made. This consisted of four drawers side by side so that they rested across the rear side facing seats. The top of these drawers provided a two foot square working surface for preparing meals while on the move and also a position for the "No.1" grub box. On the floor under this contraption was positioned a ten gallon water tank, Photographic equipment and food were carried in these four drawers. It will be seen that easy access was gained to these containers from inside the dormobile and from outside when the rear doors were open. Now "what to take" To cut out all but essential items it was decided right at the start that personal gear should be kept to a minimum, all equipment were possible would be communal. Therefore each member was allowed an army large pack to contain personal gear, like change of clothes etc. These packs were stowed under the seats. Since the Navigator allowed the Q.M. Food little time for provisioning en route, a weeks supply of non-perishable food was carried. This was packed in the containers already described and the tin stuff in the lockers under the rear seats. Between the driver and the navigator was secured a box fitted to hold the four vacuum flasks, maps and navigation impedia. The tow rope, 16' of 3" circ. sisial, was carried on the front bumper. The van tools etc. -were stowed in the van's tool box under the driving seat. The first aid kit and fire extinguisher were accessible from the outside via the rear doors. In the event of any emergency the first reaction would be for all to get out double quick and then retrieve first aid equipment. This proved very true as events turned out. On the last two days the van was found to have developed a top heavy roll caused by the diminished weight of food in the seat lockers and other inside containers. This was rectified by transferring all the sleeping gear from the roof rack to the seat lockers. In all, every piece of equipment had a planned allocated home inside or outside the van and in practice the arrangement seemed to meet with everyone's approval. The only exception was the 1 gallon plastic milk container. This found itself a home on top of the meal preparation surface from where it frequently slid or flew in all directions. Since returning from the expedition many people have questioned the wisdom of taking a 14' square tent which with poles weighs in the region of 156 Lbs. The whole question of tents was the subject of long discussion especially between the Q.M. Gear and the Camping Leader. We decided as we did for many reasons, the principle ones being: Using five members as tent pitchers (and strikers) time factors were of no consequence. In the event of bad weather all the party could be accommodated under one roof including meal preparation (Note the time we lost anyway at Snowdon because of rain) In retrospect we are agreed that we would take a similar tent again. THE INNER MAN By B.H. Food supplies were more than adequate and on the whole everyone was well fed. Owing to the nature of the expedition food had to be carried mainly in tin and packet and with the result that the meals whilst satisfying lacked any variety because even in these modern times there is a surprisingly small range of canned and packet food. Canned tomatoes proved in spite of their convenience generally unpopular particularly at breakfast. The reason for this seems to be that food tended to lie, rather heavily on the digestive system early in the morning due no doubt to travelling in cramped conditions straight on top of eating a meal. Sardines also were rather unsatisfactory because of their "repetitive" nature. Ryvita proved to be ideally suited to our needs. A surplus occurred in tea, margarine, cooking fat, cereals. Lettuce goes bad in the confined travelling conditions of the van. More canned rice and canned fruit a definite, On the average I suggest a tin a day over our last quantity. Could as a result of the experience gained have been reduced very slightly on the overall price. Possible in region of about 15/-. Tea was our biggest loss with an 8 packet surplus. Corn Flakes, 2 packets surplus but cheap anyway. Lard, we had an expensive surplus also margarine. However these savings would largely be offset by recommended increases in rice and fruit. Need for greater variety but this only possible by supplementing menu with fresh food, thereby necessitating short stops every other day. Less food early in the day and more at night. Here Coffee for Midday snack (coffee proved very popular) In general we all fed sufficiently but not luxuriously still what do you expect on £20, the Dorchester Hotel? Corned Beef Pork Pies Lettuces. From the chronological angle the climbing side of the expedition proved to be very successful, we found that in every case we had underestimated our ability to walk or run up and down the selected Mountains and the party left below found themselves with little or no time for rest. This was climbed by Les and Brian, the weather was very good and they visited both Yes Tor 2028 ft and its neighbour High Willhays 2039 ft This was the only climb of which we have photographs of the summit by our photographer. This was climbed by Paul and David, due to a long hold up at the Aust Ferry they started much later in the evening than had been estimated, and finished their return journey in darkness. They encountered mist in patches but were fortunate in knowing the land over which they travelled. This was climbed by Tiggy and Rob. The weather was excellent and if anything too hot for their object. A magnificent view was to be had from the summit stretching far as the Isle of Man. They returned in so short a time to find the others still eating their lunch. This was climbed by Dave and Allen. The weather was not at all good and the whole of the climb and return was subject to a light wet mist. On the final stages of the climb they came across patches of snow. This was climbed by Tiggy and Brian. Due to the accident to the dormobile they were left just over 4 1/2 miles from the planned starting, place. The route and the mountain were completely unknown to all of us and as it turned out. we were unfortunate in our choice and the climbers encountered precipitous rock faces which were not shown on the map. Although an attempt was made to climb these it soon became obvious that a rope and climbing gear would be necessary. 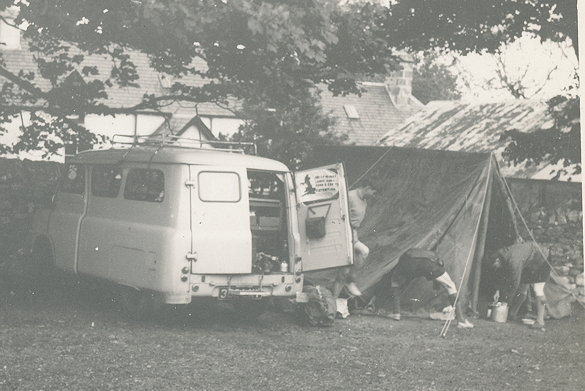 Time was very short and we could not have waited too long owing to a prior arranged servicing of the dormobile at Thurso later in the day. The climbers returned and due to the extra distance they had to walk to the dormobile which by that tine had moved yet a further four miles, were about an hour late. This was climbed by Allen and Paul. Once again the weather was perfect. A locked, gate prevented us from taking the vehicle up the four mile private road to Derry Lodge and thus nearly eight miles were added to the fourteen mile hike. Once again snow lay in patches at the summit. Very little time was saved owing to their inability to maintain a 30 mile an hour average for the additional mileage. This was climbed by Les and. Rob. The weather was dull..As there is no peak on the mountain it was decided to climb to a recognisable point on the plateau and. the trig. point 2031 above the Edge was chosen. It was found on our preliminary trip that duties in camp were best done in strict routine, the same bods doing the same jobs each day. This worked extremely well in the expedition and we found, after two days, that we could have a tent up, sleeping kit ready and be eating a hot meal only 20 minutes after we had switched off the engine. We took longer to move in the mornings probably because the effects of tiredness were more keenly felt at this time. It usually took just over one hour from setting up before we were on the road. The airing of kit while climbers were away was adequate and much appreciated when we turned in at night. There is little need for a camp leader on the trip itself so long as each person's jobs are established at the start. It was found inevitable in event of interruption in the routine, and the choosing of camp sites that everybody would have their say. 7 @ £12 84. 0s. 0d. Hire of Van 7. 12s. 7d. Petrol and Oil 23. 14s. 5d. Motor Running Expenses 15 7s. 7d. Balance in Hand 2. 12s. 10d. £84. Os. Od. £84. Os. Od. In providing first aid equipment at all on this expedition ones thoughts are channelled into three distinct possibilities and situations. Therefore the first aid equipment had to cover three eventualities unless decided otherwise. (a) Road accident (b) Climbing accident and (c) everyday camping injuries and ailments. With (a) the extreme would be an emergency stop with or without a smash resulting in seven bodies flying (in a forward direction it is presumed) around the inside of the van. The results of this would no doubt be beyond our own immediate capabilities so we hurriedly forgot the whole thing. In (b) thoughts were divided and always have been on this point in the Crew. Final arrangement was this - no individual first aid kits were carried by the climbers, minor scratchy cut or bruise would be attended to within 2/3 hours, that is upon return to the van. In the event of a serious accident to one of the climbers a personal first aid kit is of little use and improvisation with clothing etc for injuries such fractures would surfice until assistance was forthcoming. The possibility of climbers being overdue on a climb was constantly borne in mind by the climbing leader. Their intended route was also pre-mapped out and known to the whole party. Lastly (c) covered by most first aid kit contents. We made up a satchel and this was kept hanging on the rear door, easily accessible. In retrospect, other than one or two minor cuts and scratches, and a minor burn from a stove we were accident free. Unless one counts the numerous aspirin swallowed by some for reasons obscure. Having a clerical job in one of the professions it at first appeared stupid to be asked to be the mechanic on our proposed expedition, but on reflection it was perhaps better this way. Probably someone more suited to the task would have been continually worrying about the vehicle and its many possible sources of trouble. He may have, quite rightly perhaps, diagnosed a faint squeak at the back as being "the direct double-acting telescopic rear shock absorbers" whereas I, in my ignorance, merely assumed it was our equipment inside and was unavoidable. Hence we pressed on regardless. On hiring the van from a reputable firm I was able to assume that at the start of our journey the van. would be mechanically sound (or so I thought) My next step was to buy the relevant Instruction Book and study it from cover to cover. This in itself proved to be an education and I only regret that I was unable to use my newly found knowledge during our trip - or do I ?! Now for the trip proper - Trouble first beset us after we had only gone about three miles when with a loud "hiss" the rear offside tyre released itself from the necessity of carrying us any further. This wheel was speedily changed and, being a tubeless tyre, was eventually inflated at a garage. This trouble was undoubtedly due to a faulty tyre, and in my opinion the van should not have been allowed out on hire in such a condition - the wall of the tyre having been previously damaged beyond repair. We continued our journey without a reliable spare until in Monmouthshire, whilst descending a hill our driver used a little too much strength in changing gear only to be left with the gear lever in his hand. This, at first appeared disastrous as we could not obtain a spare, but having fitted a piece of steel water pipe we were able to continue on our way. The navigator, however, now had the additional duty of holding the gear lever whilst travelling in second gear. Thus we proceeded until early one morning whilst driving along a track in the north of Scotland we again met apparent failure to complete our trip. Being asleep at the time I am not well acquainted with what happened but having stopped and been awakened I climbed out of the van which was at that time in a ditch with a puncture in the front nearside tyre. We then set about filling the ditch with rocks and stones until we were able to reverse out and back on to the track. Whilst this was being done one member of the party proceeded on foot to the nearest phone box (about 5 miles) and called the local garage (a further 15 miles) Not having a reliable spare wheel we proceeded back along the. track only after we had partially unloaded the van. Eventually we were met by the man from the garage who brought a spare wheel with him for our use. He then set off to his garage with our two unusable wheels Whilst we reloaded and then carried on to his garage in Tongue. Here it became necessary to purchase a new tyre and have the other vulcanised before we could continue our journey to Thurso where we had arranged to have the van serviced. This was carried out immediately upon our arrival and most efficiently by Mackay's Garage to whom we are extremely grateful. By the time we arrived back in England the tyres were becoming quite worn and it was not long before we again had tyre trouble. In Yorkshire we had to have another tyre vulcanised as we had worn through a plug which had been. inserted to stop a previous puncture. This was the occasion when we managed to have our van left with only one wheel, whilst we were changing them around in order to keep the good ones in the front. Hence it can be seen that having arrived home with over 2,300 miles "on the clock" after only a weeks travelling, our major setback as far as my duties were concerned was tyre wear. Tyres are rather unpredictable and one cannot be sure of setting out with new tyres on a hired vehicle. It is obvious, however, that with a modern vehicle and a little bit of care and attention, it is quite possible to complete such a journey as ours without any serious mechanical fault arising. Vehicle Used Bedford Dormobile fitted with -12 seats and side windows. Petrol consumed 31 gallons - top grade. Miles per Gallon 25 approx. Cost of Petrol & Oil £23. 14s. 5d. The hire of the van would normally have been about £21 but maintenance and repair bills incurred were deducted by the hire firm. The total cost of repairs were £15.7s.7d., the biggest item being the new tyre. PUBLICITY AND PAPER WORK By P.M. As far as the writing of letters were concerned the job of Scribe Was impossible for one man; the mechanic was in a far better position to write to Mackay's in Thurso, the Navigator in Chief was in a far better position to write to the A.A. for details of the remote roads and the same was true of the many other letters that were written, of which I knew nothing. 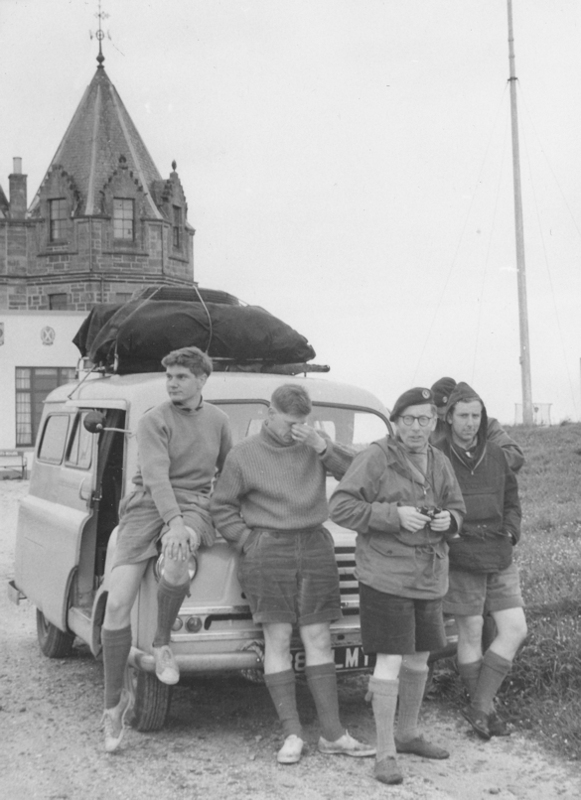 As far as the trip was concerned my main job was always done by the respective navigator and the only duty performed by me was to ensure that the postal authorities at Lands End and John o'Groats were not neglected. The job that I have done would better be described as publicity agent for a great deal of work has gone into this field and I have classified it under the heading by which we have been or hope to be publicised. This document, produced by Tiggy, set out concisely the details of our planned trip in full about 100 copies were duplicated on blue paper (hence the name) and were sent out to anyone who we considered may be interested in the trip; what we were out to do, exactly who was going, and where and when we would be going. Following an advertisement in the "Scouter" "He-men Wanted" we informed the publicity department of our plans. By the nature of our trip it proved impossible to include our trip in the Scouting Publicity film which, they were making. However the contact with I.H.Q. proved very fruitful. We found that we were able to obtain our films from them at a considerable discount and they been our agent of contact with Vauxhall Motors. Following the suggestion by I.H.Q an article has been written for Bedford motors Magazine. The article itself contained about 1,600 words and a very good selection of photographs were sent with it. Up to now we have been told they are going to print the article but not able to say when. A short article appeared in the Evening News about four men who had been round Britain by car, and I took the opportunity of writing to them and explaining our planned trip. The result was that they firstly verified it from I.H.Q. and then phoned Tiggy for further information. However it appeared that a Bank robber took pride of place. Jack Skillan, the writer of Rover Roundabout in the "Scouter" has been informed of our plans from the start. The trip has been the source of our being mentioned in this article on three occasions, one of which included our challenge to all other crews to beat our record. As a result of this I have received three enquiries from crews wishing to accept, and I have replied to these in length stating the exact nature of the challenge and our suggested minimum requirements. Upon our return a brief account of the trip was sent to the "Romford Recorder" and the "Romford Times". In spite of the Printing Dispute which was in full force at the time, we were allocated a generous amount of space by both papers for the report of incorrect facts!! I have endeavoured to report fully the details of the trip both before and after the event. The Woggle has a circulation of about 100 copies and is produced about once every two months. Two articles appeared in the first issue upon our arrival home, one by Tiggy on the statistical side and a second by Les. on the more humorous side. Jack Skillan has suggested that in order to further our challenge to as many ears as possible, it would be a good idea to present ourselves before the London Rover Scout Council to issue our challenge in person. I suggested that we could at the same time show a few slides of events and the idea was greeted with enthusiasm. This meeting will probably be in January. The Editorial Board of this magazine are "more than enthusiastic" to make the story a Leader Article and about 2,000 words have been written accordingly. The story together with photographs will appear in the Winter edition. PHOTOGRAPHY By B.H. On the trial trip in October 1958 one of the experiments was the making of a short cine film. The purpose of the film was to provide a form of visual diary of the various events as they took place. This could afterwards be shown not only to members of the Crew, but also to the younger members of the scout troop and others whom we hoped to attract as members as a result of seeing something of our activities. The trial trip was a success and on our return we decided that a longer film should be made of the main expedition. First and foremost of the several aspects of making the film was its cost. Since this was a private venture and in spite of the generous help of Kodak Ltd we had to keep the cost down to a minimum. Secondly was it to be in black and white or colour? This secondary point was, however, soon dispensed with, as on 8 m.m. film (the gauge we used because of its economical cost) colour is virtually the same price as black and white. Thirdly, it had to be long enough to cover all aspects of the trip adequately without being so lengthy as to become tedious to the audience. Bearing all these points in mind a film of 550 feet at a cost of £11 was shot on a Bell and Howell fixed focus type of camera. This camera possessed a considerable depth of field thereby dispensing of the necessity of constantly changing the lens for close-ups. Much of the film was shot from the interior of the moving vehicle, either through the front or rear windows. Whilst this obviously had its limitations it did give the audience a sense of participation in the trip with us. The exterior shots were very largely of the type of country and terrain over which we travelled e.g. the rough boulder strewn roads of the wild north western Highlands, showing our van negotiating the tricky and difficult hairpin bends over the loose earth and stone surface. Whilst no written script was made (or indeed possible!!) an attempt was made to portray each day's events of interest as they happened, including such fortunate and unexpected photographic subjects as the sunset over one of the Scottish Lochs. Finally, the credit titles had to be devised, photographed and then processed Credits usually consist of the usual details of who is presenting the film i.e. "The 3rd Gidea Park Rover Crew", "Colour by Kodachrome", etc. and finally the main title, this of course, being the most difficult choice. it must be based either on the films contents as a whole, or else a particular part of it. After some deliberations the title chosen was "Along the Queen's Highway" The reasons behind this choice lay in the fact that much of the film taken was of a van travelling along the Highways of Britain, and also it was the title of a song well known from the "Gang Show". At last all the editing, cutting, titling was complete and the film reduced to 500' in length (50' having been scrapped during editing) ready for projecting as a silent film. A preliminary run through of the film was made to try and ascertain a satisfactory commentary to accompany the film, and to assist in this written notes of suggested comment ware made. The method of recorded sound used was one with the aid of a tape recorder and briefly it is as follows. A tape recorder runs at two or more constant speeds, whilst a cine projector generally has provision for varying its speed of projection. At the normal silent projection speed of 16 F.P.S. (i.e. 16 pictures per second) the two piece; of equipment, the tape recorder and the projector are in exact synchronisation. To achieve this synchronisation some means must of found of ascertaining accurately the projection speed of 16 F.P.S. To do this a device called a "stroboxape/wheel" is used. This is a disc divided into a certain number of accurately predetermined black and white segments each equally spaced apart. The disc is then mounted onto a spindle near to the feed spool or the tape recorder and at the same level. The tape is then taken from the feed spool and round the strobodix and the beam of the projector is so arranged as to permit the light rays from the beam to fall on the disc. When all is ready for the recording, the projector is set in motion, and the operator presses the record button. The projector speed is then adjusted until the strobodisc segments remain steady when this is achieved the film will be suitable for recording a commentary to coincide with the pictures on the screen. Until this balance is reached suitable background music is played to match the titles i.e. "A long the Queen's Highway" The commentary is then spoken whilst occasionally checking the projection speed for variations due to mains voltage etc. The main point about commentaries is to avoid (a) repeating yourself, and (b) saying repeatedly "well here we see so and so" etc. or (c) Making comments about events which arc obviously self-explanatory. Suitable background music was used to coincide with the type of scenery or event taking place on the screen and to "fill in" where commentary became unnecessary; thus avoiding long pauses in the speech. After recording is complete all that is necessary is to rewind and use the same procedure as before except to use "play back" instead of "record"
CONCLUSION Whilst this may all seem somewhat crude, and amateurish by some standards it never-the-less provides a film which we hope has fulfilled the purpose for which it was primarily intended. Namely, the extension and furtherance of the World-wide Brotherhood of Scouts. Although the expedition was planned and carried out within the Crew membership without deliberate assistance from outside it is inevitable that our thanks must go to groups and individuals who "helped us on our way" We would like to put on record in these pages some of those people. Mackay's Garage, Thurso For a complete servicing carried only an hour or so before closing time including a minor welding job for which their bill was equal only to a few pints of oil. Garage at Durkar, Derbys For unrestricted loan of jacks and tools. Jack Skillan For all the "mentions" in the "Scouter"
and one after the trip. "Minnie" and Bert To the former who met us unexpectedly en-route with coffee and to Bert Hobson who waited by the roadside in his part of the country but missed us. To all who sent us telegrams, letters and cards of congratulations and good wishes which we received at Thurso. And finally to all who have shown such a great interest in what we set out to do.